I’m ramping down, clearly. One of the only things I sketched today was Donatello’s sculpture “Abacuc,” in the Opera del Duomo museum. Next post will be made in the U.S.A. Get’r done. Meet Rachel. 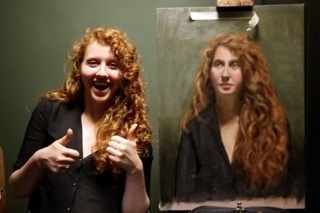 Or maybe it’s her older sister, or her distant cousin, but it was definitely American art student Rachel who sat patiently for 7 days while I slathered pigment across canvas with nearly the dexterity of that painting elephant. She approves! Aren’t you getting sick of this lovely face? Me too! But I think I made it better, at least. The hair is still retarded, but I have 6 more hours to figure that out! And then I’ll stuff my face with Italian food for most of the following 36 hours! Well, I’d hoped to have something a bit less flat-looking by the end of the day, but it’s all part of the learning process. To paint a picture, you have to juggle a lot of divergent concepts, such as 2-dimensional measurement, how 3-D objects behave in light, perception of tone and hue, and knowledge of anatomy. Add to that the learning curve of figuring out how oil paints behave and the mad-scientist chemicals you need at your disposal, and it’s no wonder a newbie is limping toward the finish line! I know the knee-jerk response will be “you’re too hard on yourself,” and “it looks great,” but rest assured that I’m not beating myself up. I’m enjoying the hell out of this! And I’m sure I’ll find further enlightenment in the final two sessions, and maybe even surprise myself with the final result. What I enjoy about this class is the same thing I like about my drawing class in New York: the teachers are neither condescending nor falsely encouraging. Like training wheels, or better yet, bowling bumpers, they keep you on the right path, and if you’re willing to pay attention (jury’s still out! ), eventually you’ll be able to succeed on your own. I think I’ll always gravitate toward digital art, but I had an idea today, that I’m sure has been done. I had my digital painting of my sister’s dog printed on canvas and it looked pretty good. What if I painted digitally up through the first painting stage, had it printed, then did second painting on top of it? Then I’d have a truly one-of-a-kind oil painting, but save about 10 gallons worth of paint I would have wasted on the hard part. Lazy or genius? Don’t answer that. No, I’m not being redundant; I’ve entered the phase known as “first painting.” Yesterday I did “dead coloring,” or filling in the cartoon (yup, the line drawing is called the cartoon) with flat, average shades. In this picture, the hair is still at that stage. The idea of first painting is to start to give form and depth by adding different tones. After a rocky start, the instructor helped me mix the right colors for her face, and I think I made some decent progress after that. Tomorrow I’ll finish the face and move on to the hair. I think a lot of us are worried that we won’t have enough time for second painting, where you add a lot of the detail and finishing touches, but unlike several of them, I’m not really fretting about it. No matter what, it’ll be the best oil painting I’ve done in my life! I’ve definitely done this double-take more than once here in Florence. Wonder what kind of reaction I’d get if I went in tomorrow, scribbled this, and ran out the door to spend a leisurely week getting fat(ter) on gelato.